Hamburgers are a favorite of both Canadians and Americans year round, but there is nothing quite like grilled hamburgers. This is a very tasty hamburger recipe, with lots of variations. Combine the first 11 ingredients and mix well. (The egg and bread crumbs are optional. I like it with them because they allow the meat to stay together better). Shape into 4 very large patties or 5 smaller patties. Place the patties on a grill over medium coals and grill 4-5 minutes on each side, or until desired degree of doneness. Top with cheese for the last minute of cooking. Serve in buns with your favorite condiments and toppings. Fancy up your burgers. Put a small cube of cheddar or blue cheese in the middle of the patty as you make it, then shape the patty all around it so the cheese is well hidden. Grill as directed. When the hamburger is eaten the gooey cheese inside will be a nice surprise. As stated above you can use a mixture of ground meats instead of all beef. Try a mix of beef and pork, or beef, pork and veal. Wild game meats also make a great hamburger recipe. They are naturally lean and full of flavor. If you have access to that kind of meat, try it. Of course you can also make bbq hamburgers out of ground chicken or turkey. They do need extra moisture added though, so you may want to look at adding a bit of water or milk. 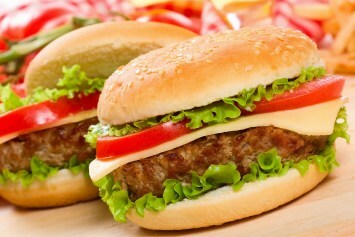 For something even healthier use ground chicken or turkey and serve the burgers on whole wheat buns. Although this recipe is for beef burgers you can use any mix of ground meats for hamburgers. A mix of beef and pork is nice. The pork is a softer meat than beef and the tastes work well together. Turkey or chicken are lean and healthy choices. You can buy ground beef in varying grades.Those with less fat are seen as healthier, while the slightly more fatty beef has a bit more flavor. With this recipe though the meat is quite flavored by the seasonings you add, so flavor is not an issue. Use as lean a meat as you wish. I like to add egg and bread crumbs to the meat as I think it stays together well and it adds moisture to leaner grades of beef. You can make them without if you prefer, but give it a try with the egg and bread crumbs. You might quite enjoy it, as I do. I have included these hamburgers in our selection of diabetic recipes because they are fairly low carb without the bun. Use a whole wheat bun if you use one, but try it without the bun. Serve veggies and salads alongside. Look here for a recipe for beer battered onion rings, a favorite with hamburgers. Hamburgers are a favorite for summer grilling. Try out beer can chicken for another tasty treat from the grill.